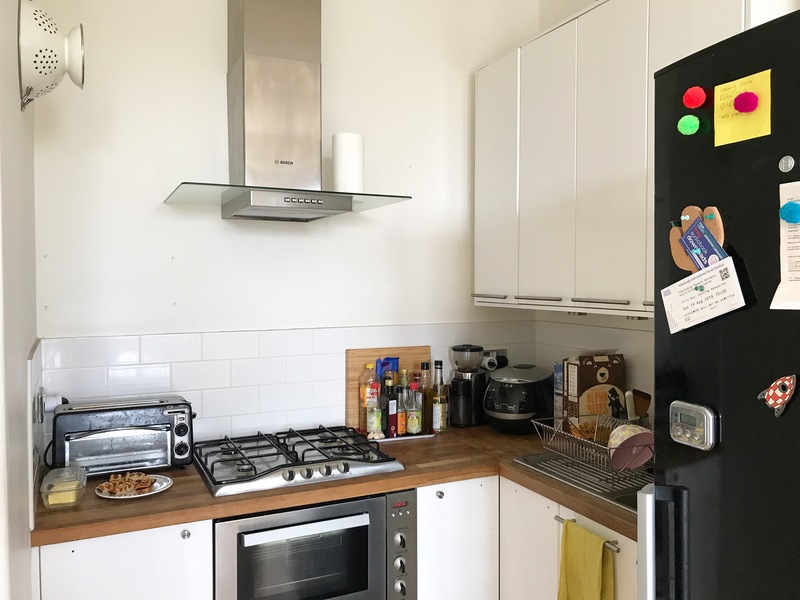 To complete the home tour of our apartment, I was going to share some pictures of our kitchen, but since starting my little series we have actually moved house! We’ve said farewell to our views of Edinburgh Castle, and moved in to a place of our own just a couple of blocks up the road. 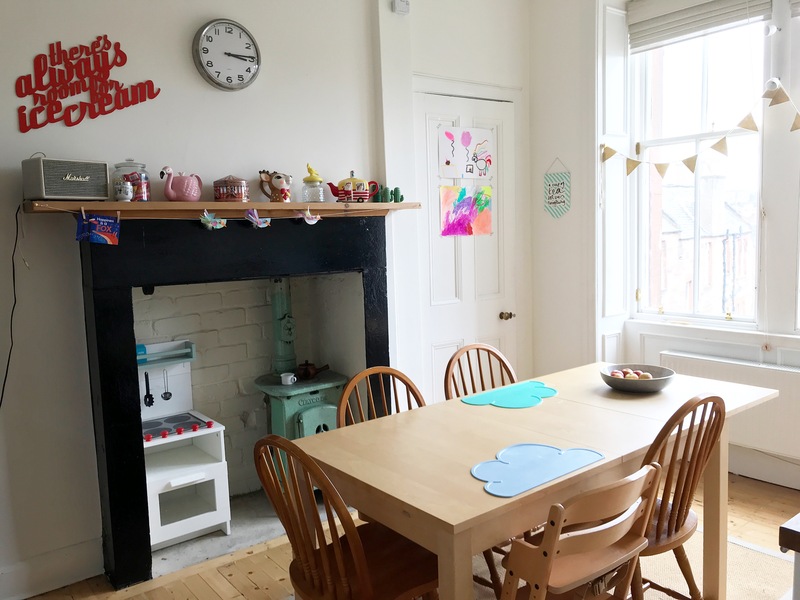 But I’ve decided to share the kitchen pictures anyway, because it was such a beautiful apartment and our happy home for our first year back in Scotland, so it will always hold a special place in our heart – it feels like the perfect way to document that and bottle up the memories to look back on in future. And, you know, once we have our new place all sorted out I can start a whole new home tour!! This was our kitchen before we moved in. 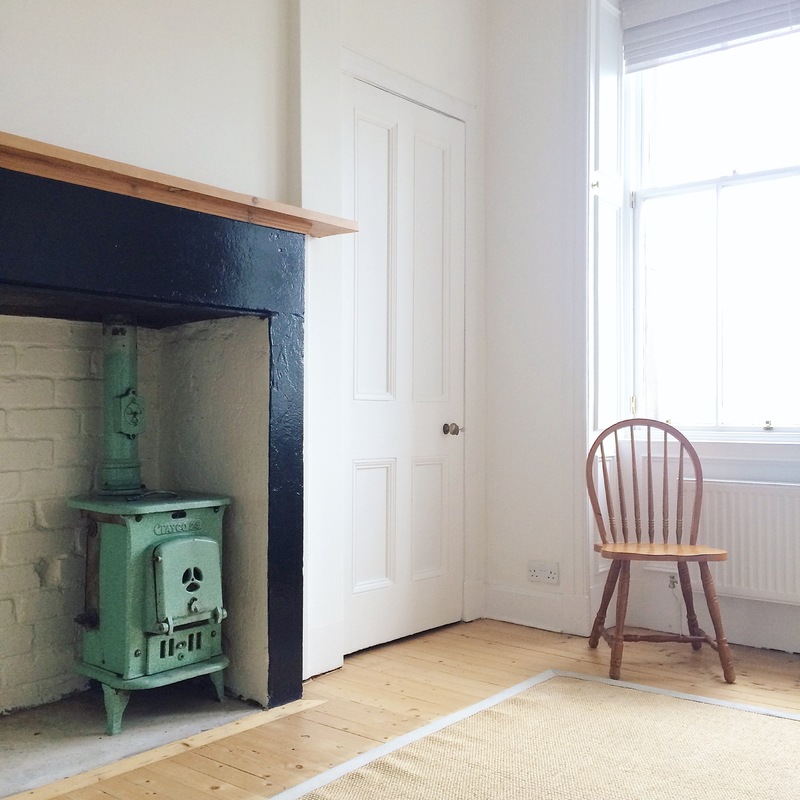 As soon as I stepped in to this room, and saw the cute little vintage stove (even though it doesn’t work any more) and the view of Edinburgh Castle out the window, I knew this was the apartment for us! 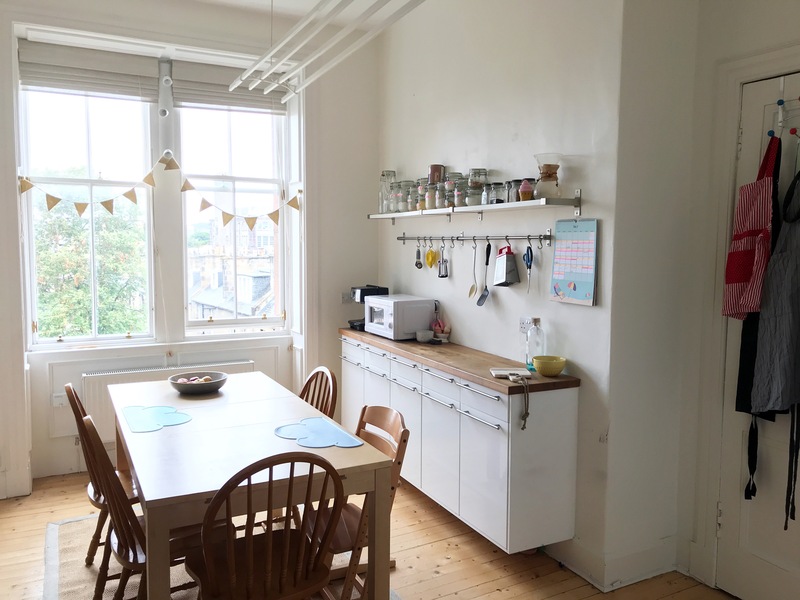 Not that we had that much choice, as the market for unfurnished rental apartments in Edinburgh is extremely narrow, but we cancelled the other couple of viewings we had set up. 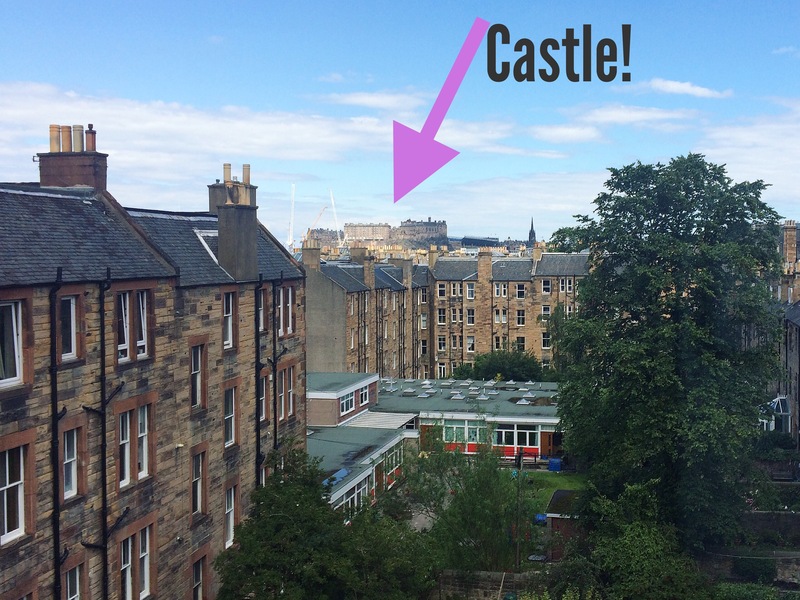 Oh yeah, did I mention that Castle view? We had an amazing first Summer here, with a prime viewing spot of the Festival fireworks every night. I know some people find the nightly fireworks extremely annoying, especially if you live nearer the Castle where they are a lot louder, but I found it strangely comforting and it was also a nightly signal to start winding down for bed. I never got tired of it all Summer. Here’s the same view of the kitchen from above, but with our furniture in it. I’ve always wanted a kitchen with a nice big family dining table down the middle, and this was a perfect fit. 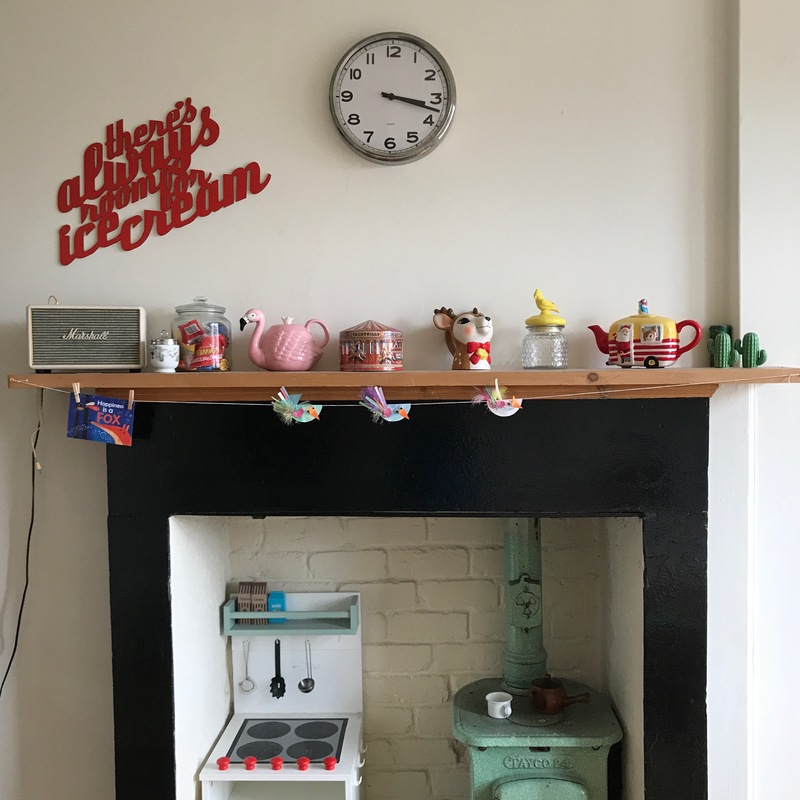 The gigantic old fireplace did take up a lot of space, that could have been used otherwise, but it also snugly fit the boys’ play kitchen alongside the little defunct stove, and especially my youngest enjoyed many hours playing there alongside me cooking. And here it is at Christmas time. I’m definitely going to miss the mantlepiece. We’ll need to create another focal point in our new kitchen. Here’s the same end of the kitchen from another angle. Above the table you can see Edinburgh’s solution to drying laundry in small spaces – just hang it under the ceiling! It’s actually genius, because it prevents drying racks cluttering up small apartments, and it also dries fairly quickly up there since hot air rises. You just need to make sure you’ve hung everything up securely so you don’t suddenly have socks or pants falling in to your dinner! 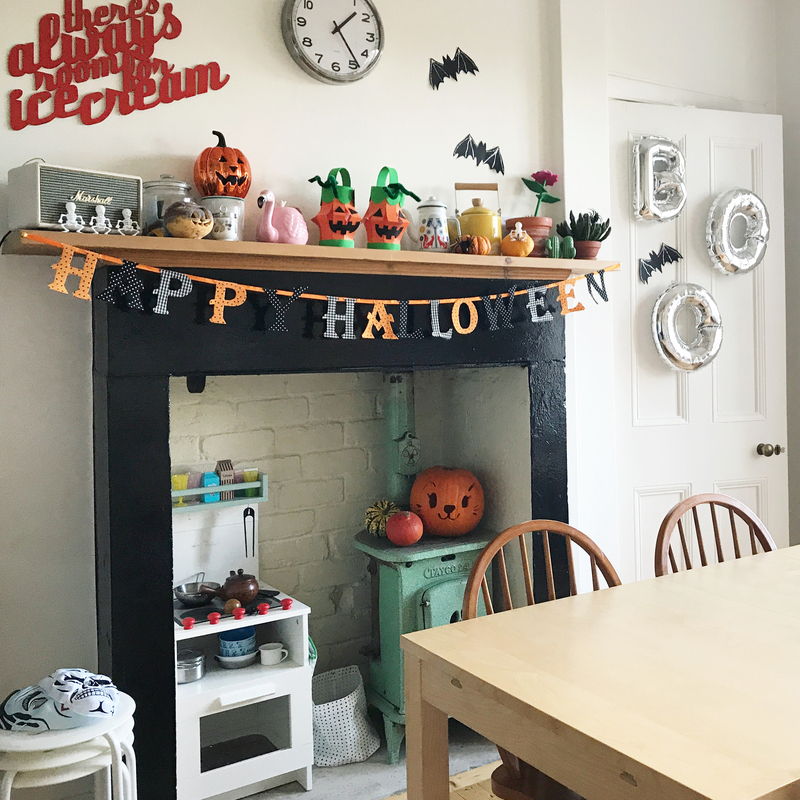 The side board and rail is something we added to the kitchen. I needed somewhere to have my extensive collection of jars ready to hand (I cook and bake a lot from scratch, so have quite a few different flours and other ingredients that needed a home), and I love having a rail to hang all my utensils on instead of having to root around in drawers. 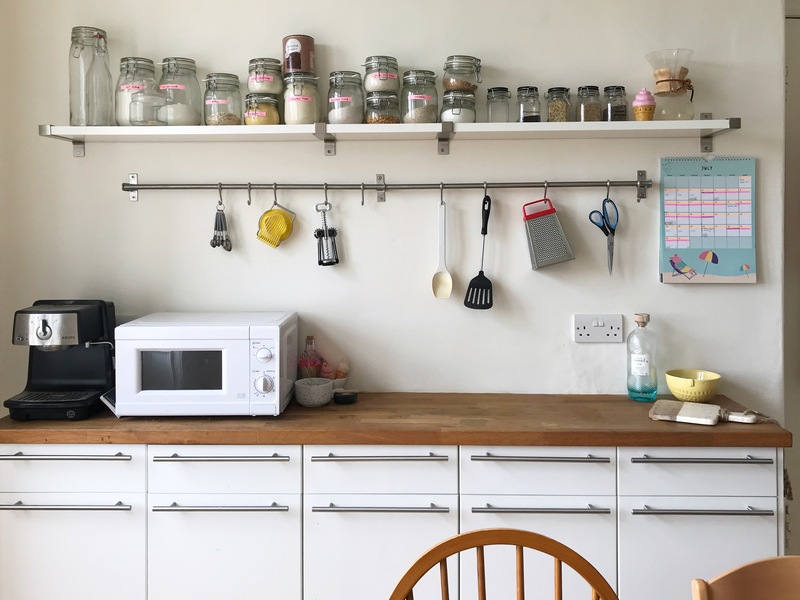 This was also just before we moved, so a lot of the utensils had actually already been packed, and I don’t think I’d ever seen the sideboard itself that tidy before, haha. Here’s the other end of the kitchen – the door to the left with all the aprons on the back lead to the hall. The door in the middle houses a tiny utility room with a washing machine and dishwasher. We never actually used the dishwasher though, because it was in a really impractical location and also because we’ve never owned one before so we were used to just doing our dishes by hand. 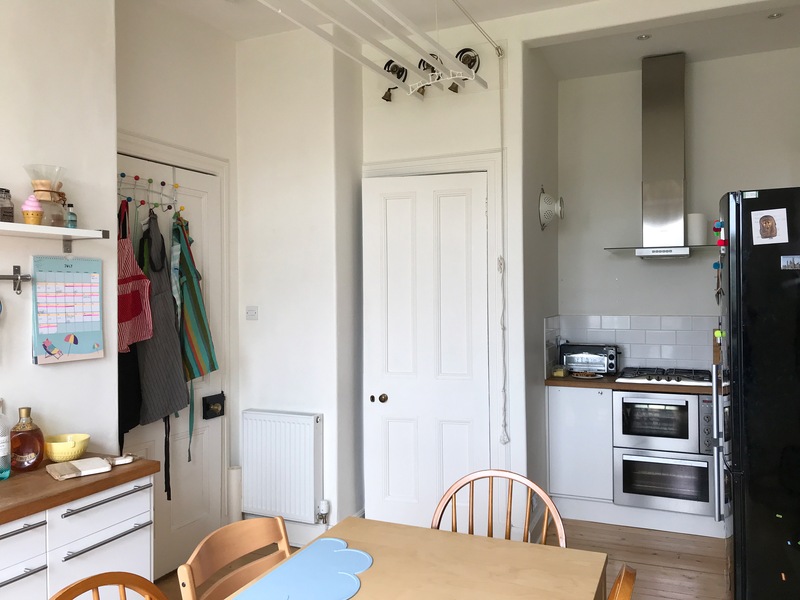 It was really useful though to have the washing machine and dirty clothes basket hidden away, and there was a lot of extra storage space in there too as the shelves went right up to the ceiling. The bells above that door are just decorative by the way, but added to the charm of the kitchen. And here’s the final corner of the kitchen. Having the cooker and sink so close to each other was a bit of a squeeze. 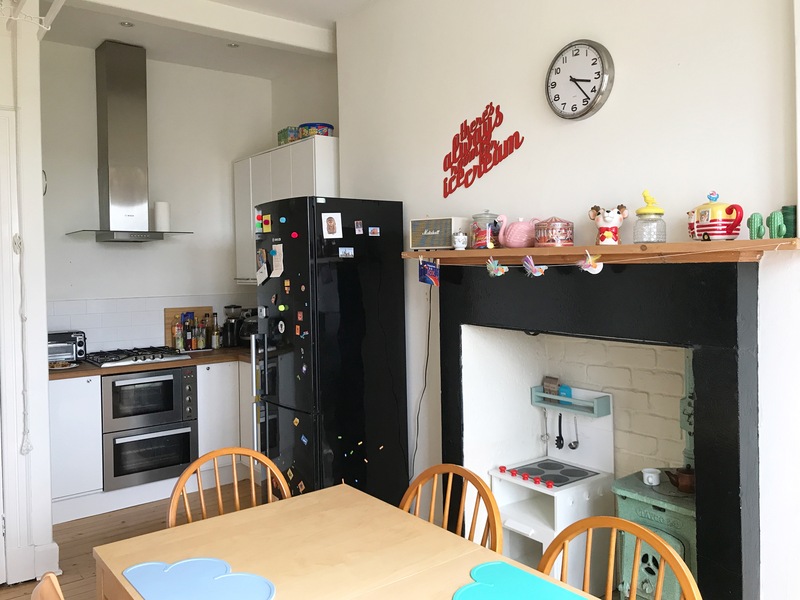 I think if we’d owned this place rather than just rented it, we would have remodelled the kitchen to organise this in a different way. But we managed. To the left of the cooker you can see our trusty toaster over, which we brought back from Berlin. It’s great because as well as toasting bread you can also use the bottom part for things like making melted cheese on toast, or heating up left over pizza quickly, lol. In the other corner, next to the sink, is our rice cooker which we could not live without. I can’t even cook good rice without one any more. We used to have just a really simple one, but treated ourselves to a more fancy one when we moved back to Edinburgh. And that’s it! As much as I am excited to finally have a place of our own, I will miss this kitchen. The charm. The view. A lot of family life took place around the kitchen table – eating, working, homework, crafting, dinner parties. I think it was my favourite room in the house. So bye bye, and thanks for the good times. On to new adventures! I love the simplicity of the kitchen design and the fact that you can easily change the accessories to make a new look. I agree the stove is really cute and makes a great focal point. I hope that the move went well to your new home and that you all settle in quickly. Oh, I love this room too – it definitely has the charm factor! 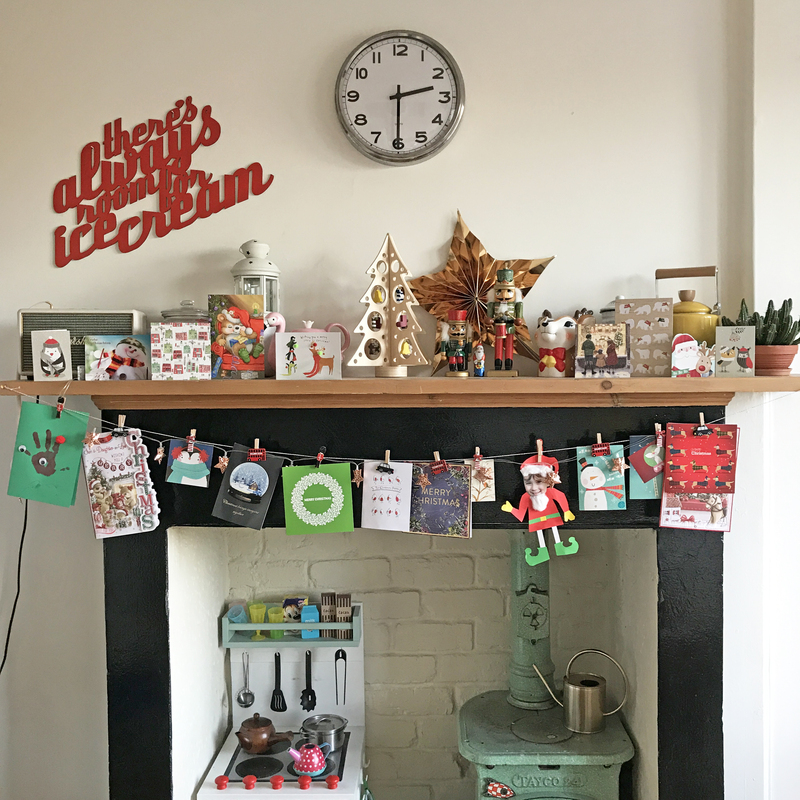 The stove is beautiful, and I love the mantelpiece too, especially how you styled it each season with all your little collections. I’m sure your new kitchen will be home to many more family memories over the years. I love Home yours and I love this kitchen! Can’t wait to see what you do with the new one too! exciting times!! I love the view of the castle, there is definitely worse views haha. Your kitchen has such a cosy feel, I think I would enjoy cooking in there! That kitchen is beautiful – you must have been sorry to leave the apartment but I’m looking forward to the tour of your new place as I’m sure you’ll make it just as homely and gorgeous!